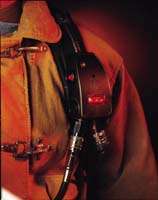 Source: Survivair, A Division of Bacou USA Safety, Inc.
Survivair, A Division of Bacou USA Safety, Inc. is an NFPA-compliant integrated PASS device. It features a sensitive motion sensor to minimized false alarms and a bright, multi-colored LED visual display. Dual piezoelectric audible alarms are incorporated for easy locating in a "man-down" situation. An optional back-mounted remote alarm module is available. Survivair, A Division of Bacou USA Safety, Inc.